The Sajda Festival of South Asian Performing Arts returns to Band on the Wall to present Vikram Hazra in concert with Soumya Jyoti Ghosh (flute), for an evening of inspirational music; a tribute to Mahatma Gandhi’s 150th anniversary. The Song of the Soul: Ecstatic spiritual poetry of the Indian subcontinent and beyond. Internationally-acclaimed artiste Vikram Hazra is one of the foremost names in Indian devotional music, having released 15 albums and packed concerts across 49 countries. He is credited as being the first to introduce the electric guitar and a jazz-rock sensibility into this genre, presenting folk music, traditional chants and ancient philosophy in an exciting world music format. 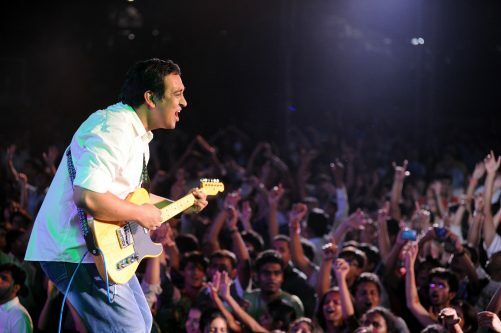 Vikram Hazra doesn’t just play music – he opens up a doorway for his audiences to touch their own soul. His concerts evoke strong reactions from diverse audiences across the globe. The Song of the Soul incorporates elements from cultures like Africa and South America, moving poetry from Kabir, Meerabai, Khusrau and Guru Nanak, as well as folk compositions from remote corners of rural India, representing Vikram’s personal journey of self-discovery through music. He is accompanied by flautist Soumya Jyoti Ghosh, one of the favourite disciples of the pre-eminent flute maestro Pt Ronu Majumdar, and one of the top recording and performing artistes in the country today. With a wide repertoire that ranges from Hindustani classical to jazz, Ghosh is a musical prodigy, an established professional keyboard player and also plays the melodica, penny whistle and dvoyanka, in addition to backing vocals and mouth percussion. This event is supported by: Travel – Ar India, Media – Asian Lite, Charity – IAHV and sponsored by the Manchester India Partnership; SBI UK; HDFC Home Loans and Indian Tiffin Room.